Anderson Flats, also known as Mission Flats or The Forks, is located within the traditional territory of the Gitxsan First Nation (People of the River of Mist) and is identified as Lax Lit Hetwit House territory. Anderson Flats Provincial Park, established in 2007, is a 99 hectare area situated at the confluence of two of the most important rivers in northwest BC, the Bulkley and Skeena Rivers. The landscape of the park has been shaped by these rivers over thousands of years, creating the floodplain and terraced terrain. The park includes 1300 metres of river frontage on the Bulkley and Skeena Rivers, 17 hectares of floodplain and the forested terraces comprise the remaining upland area of the park. Anderson Flats Park offers scenic and recreational values including regionally and provincially significant fishery values. The park provides highly accessible public access to the riverfront on both the Bulkley and Skeena Rivers with excellent recreational fishing, camping and day-use recreation opportunities from June through September for all visitors including children, seniors and individuals with limited mobility. The Skeena and Bulkley Rivers are both Class II waters; this provincial designation is indicative of highly productive streams that are carefully managed to preserve unique fishing opportunities. Both rivers contribute significantly to the province’s reputation as a world class fishing destination. Scenic values are exceptional and include views of the Rocher deBoule Range with the majestic Hagwilget Peak to the south. Motorized off-road use (ie. ATVs, snowmobiles) is not allowed within the park. To preserve vegetation, do not gather firewood within the park. Please provide your own firewood. Please be aware of provincial regulations around campfires including size not being greater than 0.5 metres, must have shovel or at least 8 litres of water nearby to extinguish, must have a firebreak and must never leave campfire unattended. Please respect the signed area along the Skeena riverbank where ecological rehabilitation work is underway to preserve and restore the sensitive cottonwood plant community. Tread carefully around riverbank trees, their root systems and other vegetation. These sites contribute greatly to the ecological diversity, bank stability and overall beauty along the Skeena River. Garbage facilities are not provided. Please pack out what you pack in. Keep this site clean for everyone. An old boat launch outside the park adjacent to the northeast corner provides a take-out for recreational and commercial rafters, canoeists and kayakers after they have floated the Bulkley canyon, and may be used for launching small power boats during favourable river conditions. Generator use is only permitted between the hours of 9am – 11am, and from 6pm – 8pm. Public safety concerns may exist along the upper section of Hazelton Station Road due to steep banks, sharp corners and potentially restricted visibility. The seasonally variable river floodplain may present safety concerns for vehicles accessing the floodplain. During heavy precipitation river levels can fluctuate quickly and dramatically. Visitors, particularly children, need to be careful when near the river. Wild animals are potentially dangerous, especially bears. Keep your distance and observe posted warnings. Wildfires are always a possible threat and are potentially dangerous in the open grassy areas, please take precautions and monitor your campfires at all times. Anderson Flats Provincial Park is located on the southeast bank of the junction of the Skeena and Bulkley Rivers, between South Hazelton and the Village of Hazelton. Access to the park is gained by travelling ~4km west of New Hazelton via Highway 16 then turning right and following along Omineca Avenue for 700 metres before turning right on Hazelton Station Road which leads across the railroad tracks and down the hill to the park. Canoeing and kayaking may occur on the Skeena and Bulkley Rivers flowing past the park. There are possible put-in/take-out locations in and adjacent to the park. An old boat launch outside the park adjacent to the northeast corner provides a take-out for recreational and commercial rafters, canoeists and kayakers after they have floated the Bulkley canyon, and may be used for launching small power boats during favourable river conditions. Cycling is permitted. No developed cycling trails exist in the park. Please stay on existing road surfaces. Bicycles must keep to roadways. Bicycle helmets are mandatory in British Columbia. Please be aware of all provincial and regional fishing regulations. Anderson Flats Park provides world-class fishing opportunities. The peak angling season occurs late July through early September. The Skeena and Bulkley Rivers provide angling opportunities for chinook and coho salmon as well as steelhead, rainbow, bulltrout and cutthroat trout. All these species migrate past this park. All wild steelhead must be released. Both the Skeena and Bulkley Rivers are designated classified Class II waters. 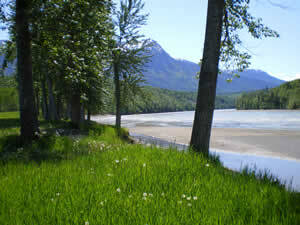 The Skeena River at this location being classified Class II July 1st to December 31st. The Skeena River is closed January 1st – May 31st. The Bulkley River being classified Class II with a mandatory steelhead stamp September 1st – October 31st. The Bulkley River is closed January 1st – June 15th. Anyone fishing or angling in British Columbia must have an appropriate license. There are no developed trails in the park at this time although numerous, short, undeveloped trails do exist. For your own safety and the preservation of the park, obey posted signs and keep to designated trails. Shortcutting trails destroys plant life and soil structure. Pets/domestic animals must be on a leash at all times and are not allowed in beach areas or park buildings. You are responsible for their behaviour and must dispose of their excrement. There are wildlife viewing opportunities in the park. Wildlife observed in the park includes black bear, grizzly bear, moose, coyotes, wolves, marten, otter, beaver, bald eagles and many other bird species. The park provides cross-country skiing and showshoeing opportunities. Snowmobiling is not permitted in the park. This park has a day-use/picnic area. This park does not have a playground. The park does provide open, grassy areas and gravel beach areas suitable for day-use although no picnic facilities exist in the park. This park only has pit toilets – no flush toilets. There is one pit toilet in the park located in the day-use area and is handicap accessible. The park provides a wheelchair accessible pit toilet.